Mahindra & Mahindra is gaining a strong foot hold in its Tractor business in India and has even started exporting Tractors to various other countires in good numbers. The recently made leader in Tractor business in India., M&M will tomorrow inaugurate their new plant at Medak district in Zaheerabad tomorrow. A senior official of the company said today that Andhra Pradesh chief minister N Kiran Kumar Reddy is expected to inaugurate the facility. M&M has an automobile plant spread over 343 acres of land at Zaheerabad, 135--km from Hyderabad, where some of its other products are also manufactured. Mahindra's have invested Rs 300 Crore at its tractor manufacturing facility which has a capacity to build 1 Lac tractors in an year. 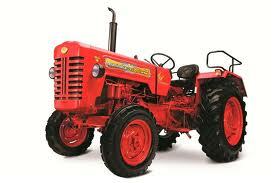 The domestic sales of tractor business for Mahindra in February 2013 stands at 13,994 units.